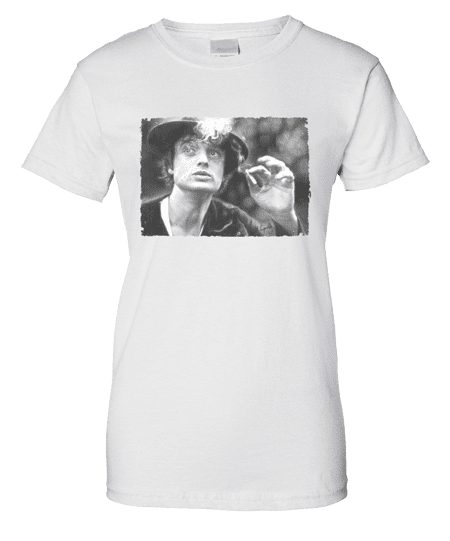 This Pete Doherty T-shirt has been drawn in pencil by Mark Reynolds. Pete Doherty (born 12 March 1979) is an English musician, writer, actor, poet and artist. He is best known musically for being co-frontman of The Libertines, which he formed with Carl Barât in 1997. His other musical project is indie band Babyshambles. In 2005, Doherty became prominent in tabloids, the news media, and pop culture blogs because of his romantic relationship with model Kate Moss and his frequently-publicised drug addictions. Doherty and Barât formed a band called The Libertines in the late ’90s, although it was not until 2002, with the release of their debut album Up the Bracket, that they began to achieve widespread mainstream success. The group achieved critical and commercial success and gained a dedicated cult following, with Doherty in particular being praised by fans and critics alike as one of the most promising songwriters to emerge on the British music scene for some time. However, Doherty’s increasing drug problems led to his estrangement from the band. In 2003, he was jailed for burgling Barât’s flat.Doherty founded Babyshambles towards the end of his time with The Libertines. The group has released two studio albums, Down in Albion, in November 2005 and Shotter’s Nation in October 2007. The band’s touring schedule and releases have occasionally been disrupted by Doherty’s ongoing legal problems.